In keeping with my previous visit, I've been trying to find more low key places to try this time around. 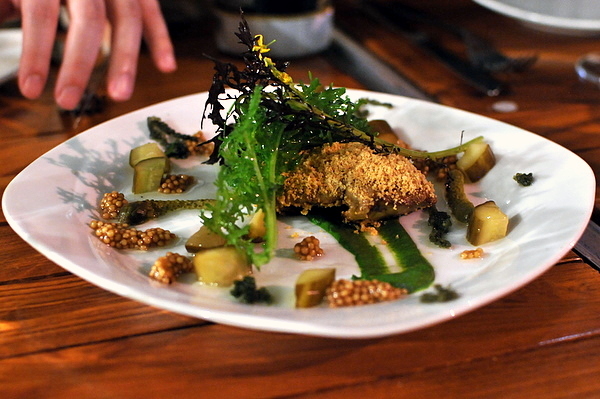 One restaurant that popped up was Mike Isabella's Graffiato. Despite the chef's extensive experience with Greek cuisine, for his first eatery, Isabella chose to draw on the foods of his youth. Born and raised in New Jersey, Chef Isabella attended The Restaurant School in New York while staging at some of the city's top restaurants. From there Isabella worked his way south to Philly where he joined Stephen Starr's restaurant empire first at Alma de Cuba then El Vez and finally at the now defunct Washington Square. From there he moved on to Atlanta and the Greek restaurant, Kyma where he would develop the skills that would lead to his job at Zaytinya Already an accomplished chef, Isabella catapulted to national prominence through two stints on Top Chef placing 7th during Season 6 and 2nd in Season 8 and from there it was only a matter of time till he opened his own restaurant. This cocktail was actually fairly tame for a mezcal based drink, alloying a fresh bitter citrus over a core of smoky mezcal. The Thai chili was evident in a light tingling on the lips but I would have liked a bit more kick from the spice. I'm not a fan of Brussels Sprouts but the combination of pancetta and maple was too intriguing to pass up. 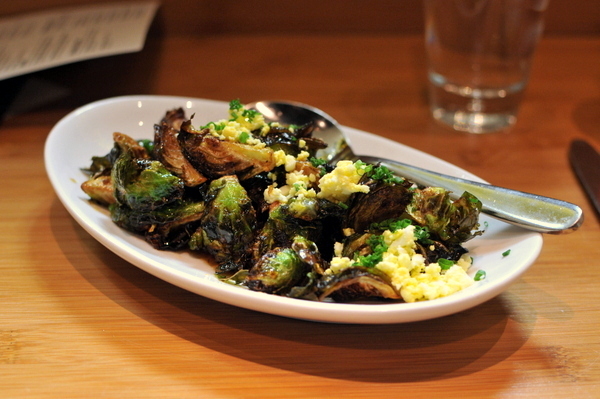 The dish lived up to my expectations with the sweetness of the maple tempering the bitter char of the sprouts. I wonder if the kitchen forgot to add the pancetta as I couldn't even taste a hint of the expected saltiness. I enjoyed the bittersweet interplay but it left me wondering just how good the dish could be with that third pillar of flavor. As intimidating as the dish might sound, it was actually quite tame. 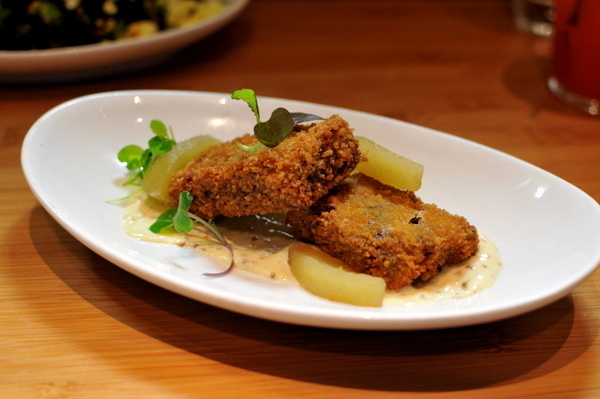 A thick layer of crisp batter enrobes the tender wickedly porcine pigs head. While the head could be a bit dense on its own, the racy tang of the mustard cut right through the richness. My server highly recommended the spaghetti, and he was dead on. 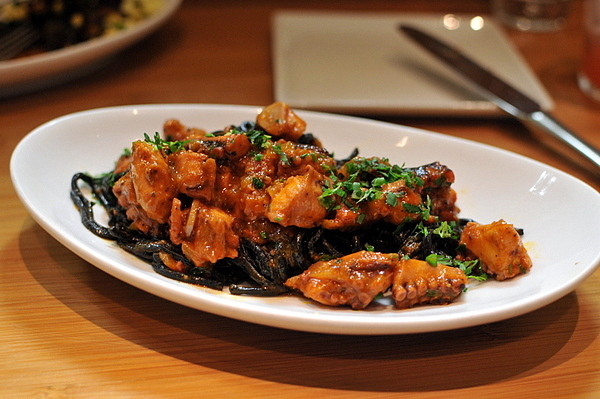 The pasta had a pleasing firmness and the accompanying octopus was equally toothsome and dense. 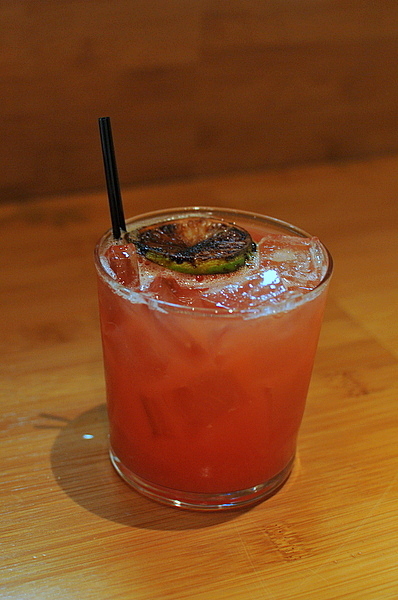 The flavor was even more impressive, a melange of brine and tomato with subtle accents of herbs and spice. 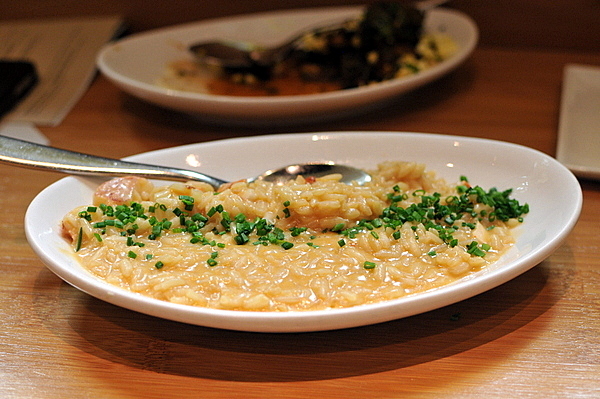 I've never turned down a risotto and I certainly wasn't gonna start with this one. A satisfying if textbook lobster risotto, the texture on the rice was superb, the sauce was a bit more robust than most, with a richness reminiscent of lobster bisque. Graffiato is known for its pizzas and though I was tempted to play it safe with the Countryman (truffle, fontina, egg) I decided to be a bit more daring and go for the Jersey Shore. My biggest complaint with Neopolitan-style pizzas is that the center can feel a bit underdone. That wasn't the case here as the pizza was cooked to perfection. The dough has a tinge of bitterness to help temper the funk of the Provelone and heat of the aioli while the calamari added an intriguing if clumsy to eat crunch. Ultimately the pizza lives up to its namesake: lusty and slightly foul yet quixotically appealing. 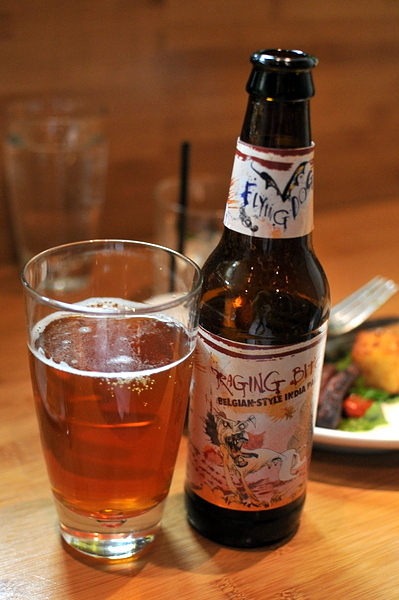 Moving on to beers I went with a Belgian-style IPA from Flying Dog Breweries in nearby Frederick. The pine and hop kick typical of an IPA battles with a ripe fruit and malt sweetness characteristic of a Belgian, a nice balance between very different two styles of beer. This was probably the weakest course of the night. The symphony of flavor between the beef, arugula, and salsa verde was actually quite spectacular, but the steak was a touch overdone making an already firm cut even tougher. The polenta was particularly impressive, the crunch hiding a complex mix of grainy sweetness and salt simultaneously akin to both french fries and waffles. Zeppole or St. Joseph's Day cake is a donut typically consumed on March 19 (St. Joseph's Day) and are popular in peninsular Italy as well as Sicily and Malta. 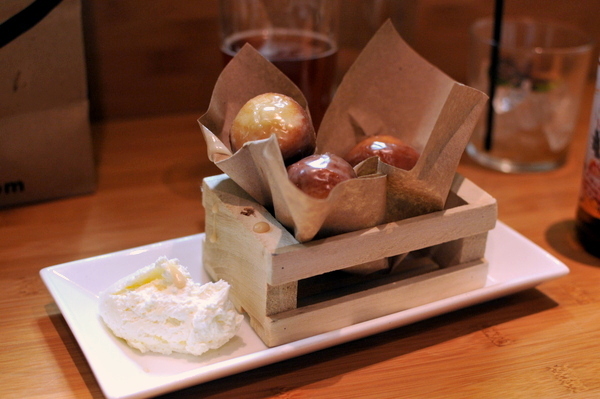 The Zeppole were nicely crisp and despite having a dough-y looking interior quite airy. The sweetness of the dessert is complimented by a light bitterness from the coffee while the marscarpone gives the dish a pleasing creamy lusciousness. 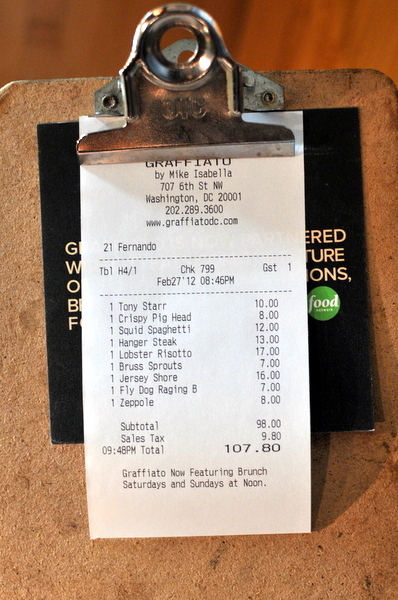 Though I missed out on Chef Isabella's stint at Zaytinya, I was exceedingly pleased by the food at Graffiato. 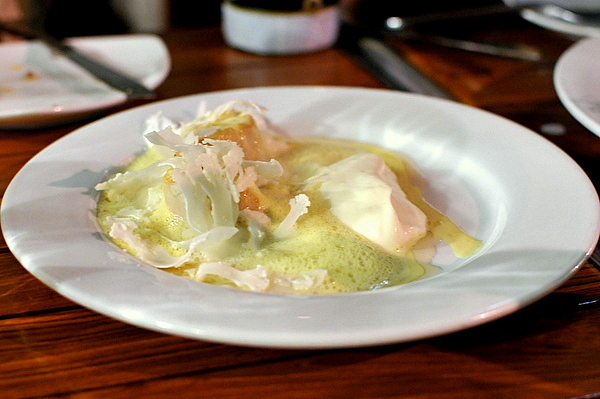 The chef leveraged his Italian heritage to produce a contemporary menu that is dynamic, robust, and approachable. Surprise surprise, yet another restaurant closing, though it wouldn't be LudoBites if it didn't close. The opening night at 8.0 was the strongest LudoBites yet and I was looking forward to seeing how the menu had evolved over the ensuing month. Aside from the Chicken Crackling, Monkfish Liver, and Lemon Meringue, most of the dishes, even the vaunted Uni Crème Brûlée had undergone some adjustments. 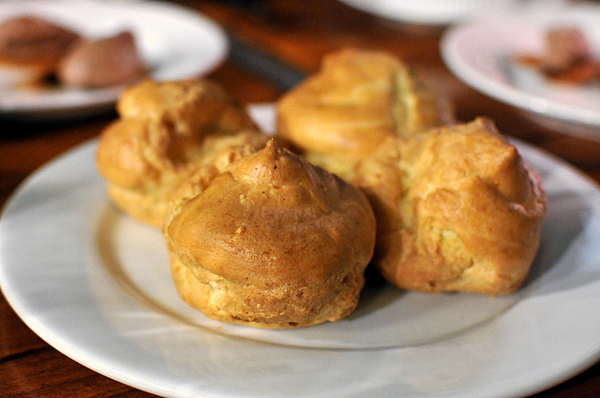 This were much larger than the typical gougere and the resultant texture was noticeably airier but the pastries lacked the robust cheesiness that I was expecting. Next up was the much beloved Uni Crème Brûlée that has captivated diners this entire run. I even heard a rumor that Ludo ran out of Santa Barbara uni and had to scramble to acquire some from Japan. 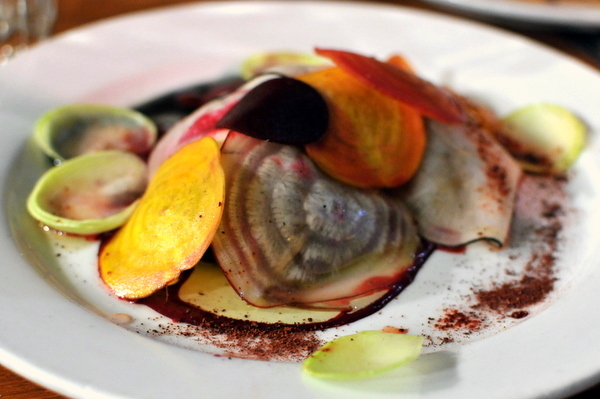 The dish is still wonderfully expressive, an amalgam of sugar and salinity with an additional bitter twist from the coffee. Where the Burgundy Gougére is a stately amuse suited to haute cuisine, the Chicken Tandoori Crackling is a lusty morsel better suited to a gourmet gastropub. The chicken skin provides an overarching oiliness to the offaly twang of the chicken liver and the resulting combination has a flavor reminiscent of Chinese roast duck. The sweet shrimp certainly lived up to its name with the miso enhancing the shellfish's natural sweetness. The mouth feel of the shrimp was softer than I liked and the starchy crunch of the beans was crucial to add some texture to the dish. 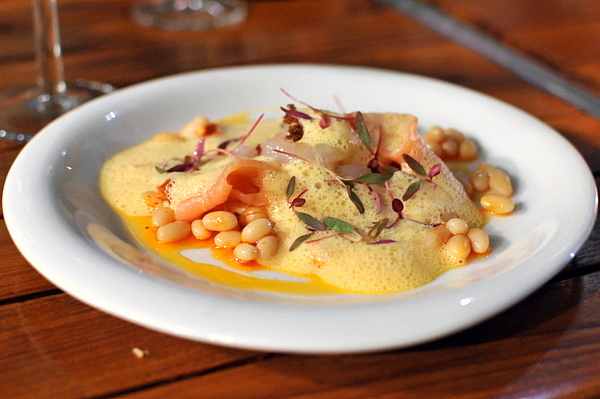 The salmon proved to be the lynchpin for this dish, providing a smoky punch that tied the dish together. I'd been fighting the beginnings of a cold and at this point I suspected that I was losing the ability to pick out some of the subtler details of the food. As a result the lobster salad tasted heavily of sweet yuzu, which coupled with the crunch of the lobster distilled this dish down to a lemon meringue lobster. At this point, my cold was beginning to affect my ability to smell as I could not detect the aroma of truffles that enraptured the rest of my table. 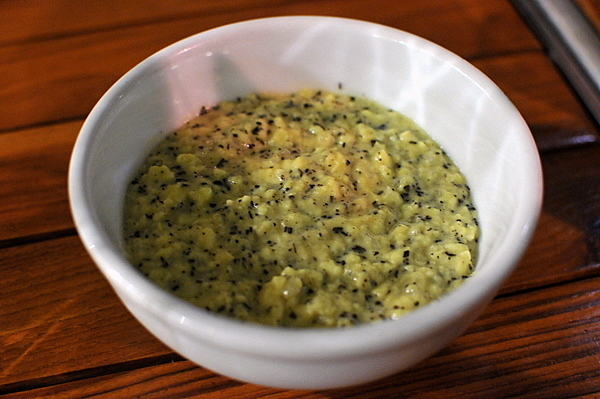 Though I don't normally enjoy soft scrambled eggs, the onion was key to balancing the texture and flavor of the egg. 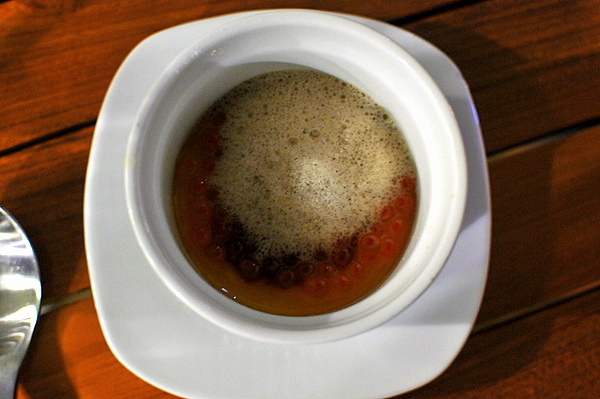 The foie gras soup was my favorite course the last time around, but the dish has changed markedly since then. 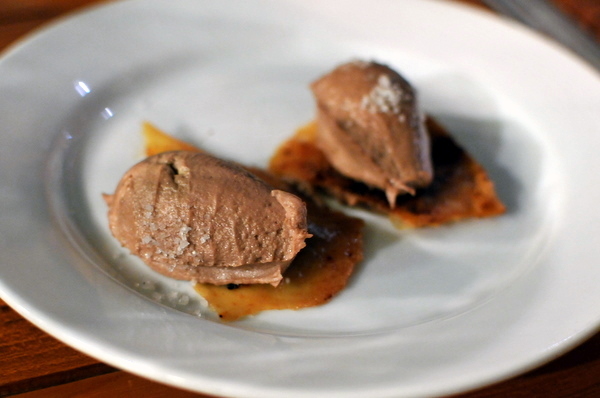 For starters the foie has changed from the star to a supporting element. 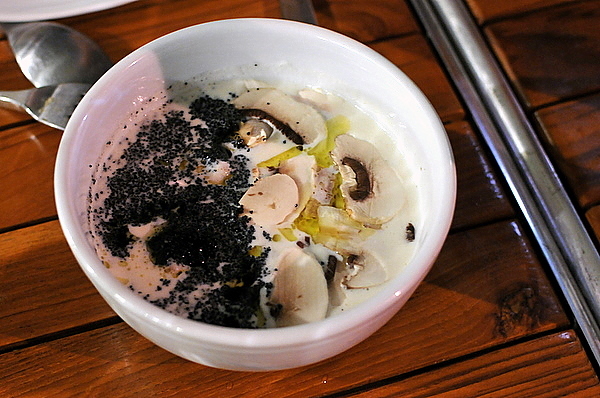 This time around it was the hearty potage, a blend of bitter celery root and earthy mushroom. 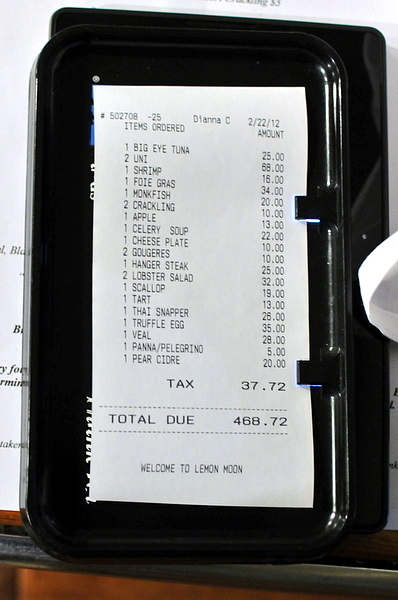 This was probably the weakest course of the night. 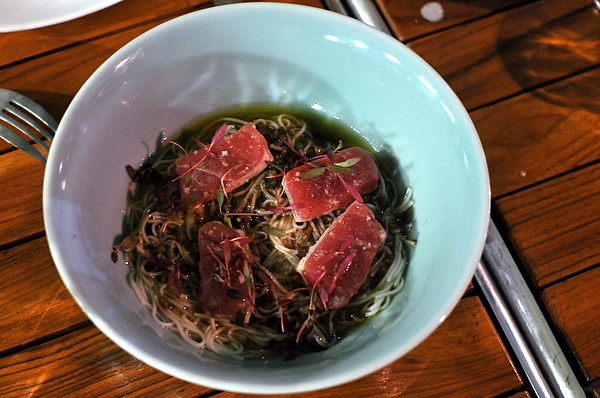 The noodle and fish were both nicely prepared but the vinaigrette was both a bit overcomplicated and too intense. I wasn't a huge fan of this dish the first time around but it seemed a bit more cohesive this time, perhaps my reduced sense of taste smoothed away some of the rough edges. 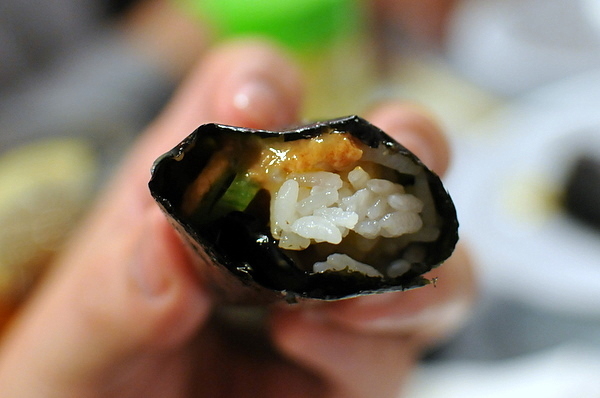 Rather than the interplay between the liver and tangy accompaniments, it was the unique texture of the Ankimo juxtaposed against the crunchy coating that was foremost on my mind. One of the things about Ludo is that he manages to be unconventional even when hes being conventional. 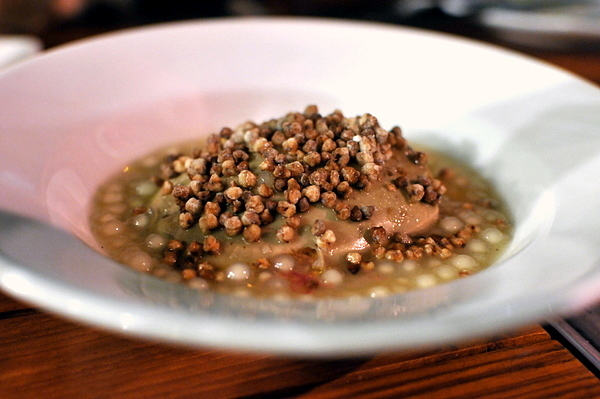 Take the classic fruit and foie pairing here, the apple provides a funky tang that cuts through the fat of the liver, but it is the buckwheat with its crunch and toasty savor that really sets this dish apart. One of the things about a diminished sense of taste, is the greater appreciation for texture, and this might be the single most exquisite preparation of cooked snapper that I've ever had. I assume the potato and leeks would be some play on a vichyssoise, but the ingredients were fairly disparate. The savory fried potato thins are reminiscent of chips while the charred leeks add a burnt vegetal bitterness. I've seen Ludo use the cauliflower and yogurt combination before but its always been a bit astringent and light for me. The problem here was I could barely taste the flavors though the scallop was expertly prepared as always, smooth slick and supple. 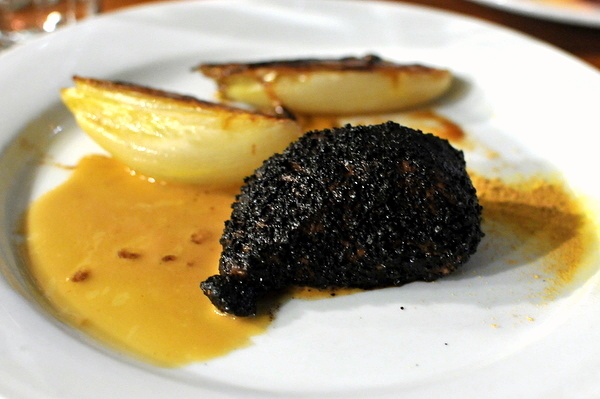 The veal is designed to look like a piece of charcoal and it does indeed look pretty unappetizing. 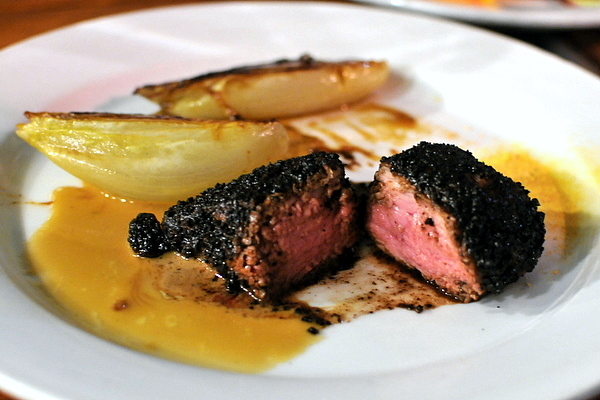 Under the oily black layer of olive tapenade the meat is cooked to a perfect medium rare. 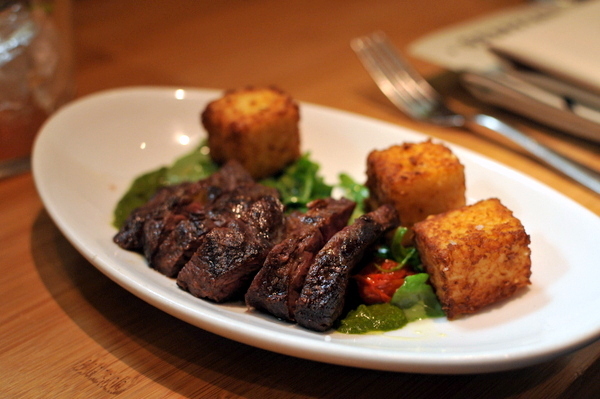 The meat is immensely flavorful and the olive is perfectly balanced with the veal's bovine sapor. The endive is perfectly charred and infused with the essence of clementine; the perfect foil for the heady flavor of the cow. 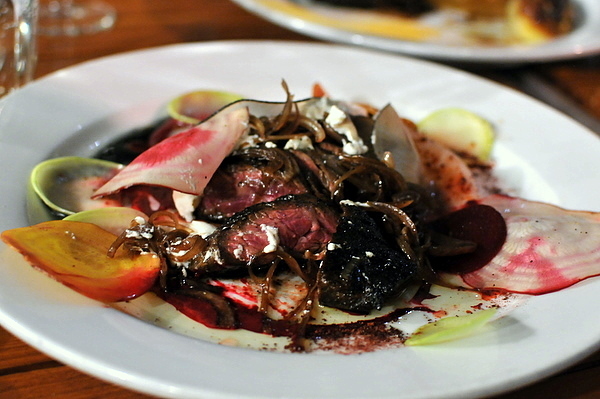 The last savory of the night was a rustic hanger steak, a cut that tends to be a more toothsome and flavorful cut than most. The goat cheese provides a gamy funk to the steak's clean flavors while the tangy shallots and crisp freshness of the beets counters the weight of the meat and cheese. 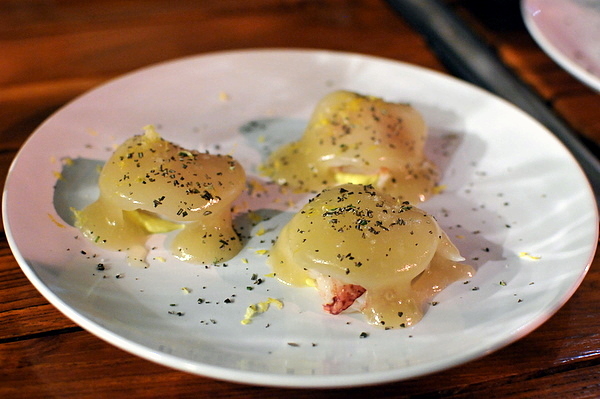 Visually this reminded me of the head cheese Ludo debuted at 7.0 and was every bit as spectacular. The cheese itself is a semi-soft cow's milk cheese. The flavor strikes a deft balance between soft acidity and rich earthy aroma. 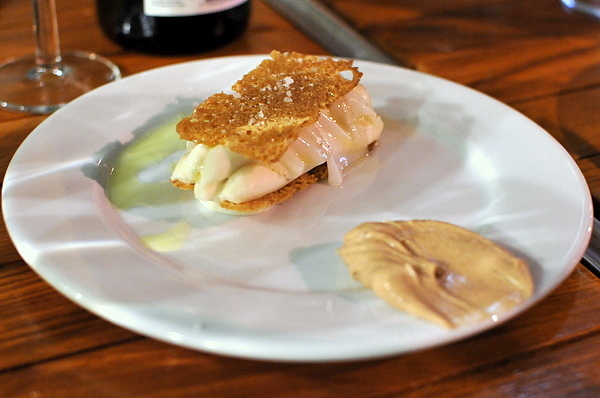 The thin lardo veil amps up the cheese's natural funk. Though our waiter said Ludo's goal was to make an adult version of Handi-Snacks, I thought the cheese was far to nuanced an elegant for such coarse comparisons. 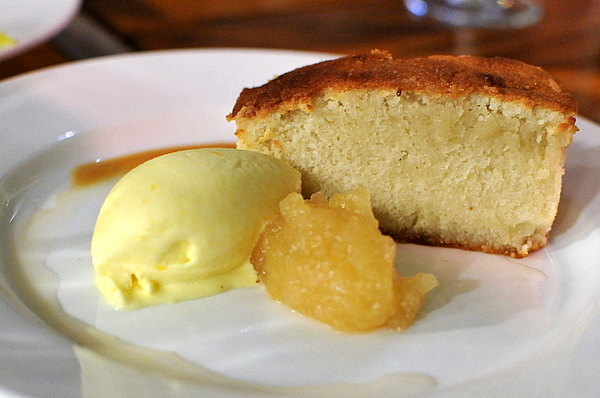 The first dessert was a dense sweet butter cake paired with fruit and a sticky salty caramel. Though the dish as a whole was delicious, it was the bracing flavor fresh orange zest from the creamsicle that was most exciting. 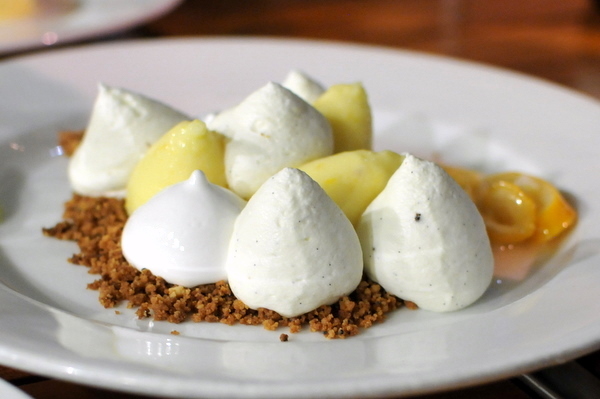 This dessert was severely compromised by my condition, The bright flavor of lemon meringue and subtle flavor of the poppy seed were almost illusory. A real shame that I couldn't enjoy this course properly. As much as I was bothered by the cold and my inability to taste or smell properly; it was an interesting to experience the slow loss of sensation and to see how much more apparent the texture became as the meal progressed. I began to appreciate the subtleties and nuances that would otherwise escaped notice. I had hopes that this would be the best LudoBites ever but my compromised sense of taste and smell made it hard to make a definitive judgement. At the end of the night Ludo shared a well-earned glass of celebratory Cava with his crew then threw out the provocative claim "Last LudoBites in LA!" It's hard to believe, but after nearly 25 years, Sushi Nozawa, one of LA's most renowned sushi restaurants will be closing. Opened in 1987, Sushi Nozawa is rightfully lauded for helping to bring traditional sushi to Los Angeles, but the restaurant might be even more famous for something else: ejecting patrons. 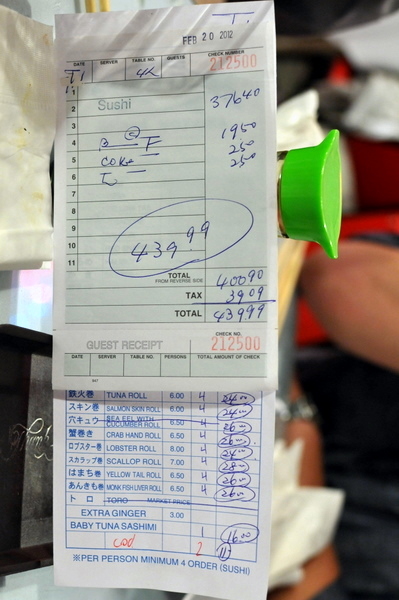 It is this behavior that makes Nozomi the most polarizing sushi chef in LA. Fans say he is a purist who provides some of the best sushi in the area while simultaneously raising Angelino's collective understanding of sushi. Meanwhile, detractors claim that the quality doesn't warrant the attitude and that the chef has become a caricature of himself, taking his "Trust Me" philosophy far too seriously. 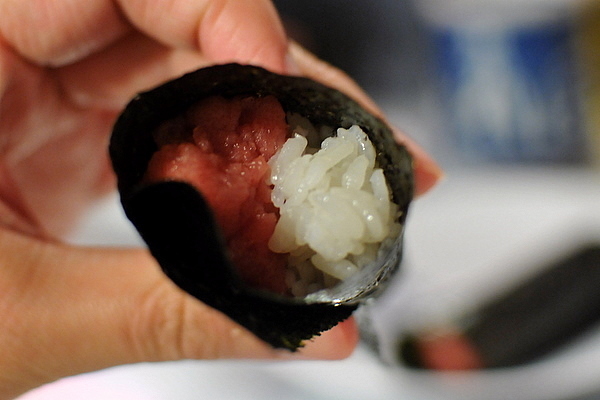 Chef Kazunori Nozawa got his moniker "The Sushi Nazi" for banning customers whose sushi etiquette isn't up to par. 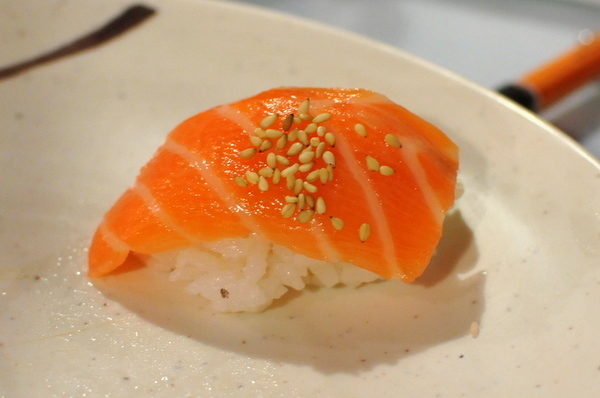 Some sushi faux pas include: ordering at the sushi bar (it's omakase only), eating too slowly, using your cell phone, asking for a California roll or spicy tuna, or even using excess soy or wasabi. Nozawa-san says he boots about one diner a month and at this point, I have to believe some people visit the restaurant fully cognizant of the rules, but come looking to get kicked out out. I've heard Nozawa's behavior explained as a cultural thing; the chef has a sincere reverence for his art and he demands the same from his patrons. This video by David Gelb, paints a more sympathetic picture of Nozawa-san humble but passionate practitioner of his craft. While I respect that and know of other itamae who feel the same way, Keizo of Sushi Zo observes similar rules and even the affable Hiroyuki Urasawa has been known to boot overly picky diners, only Nozawa-san is so upfront about it; almost as if he is daring patrons to challenge him. I have been meaning to try Nozawa since 2005, and I did stop in for an impromptu dinner in 2009, but with the restaurant closing on 2/29, I felt a more thorough sampling was in order. 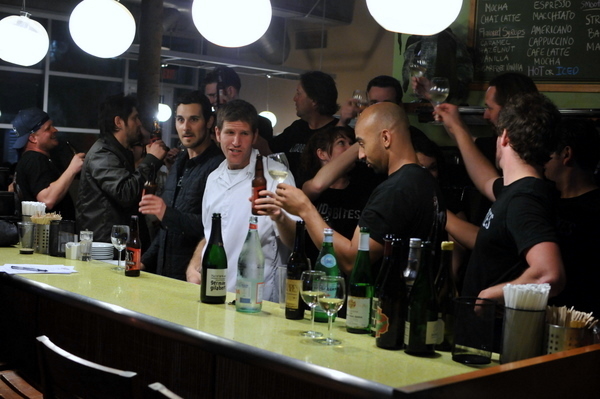 While I would have preferred to sit at the bar, we wanted to run the gamut which was easier to do at a table. 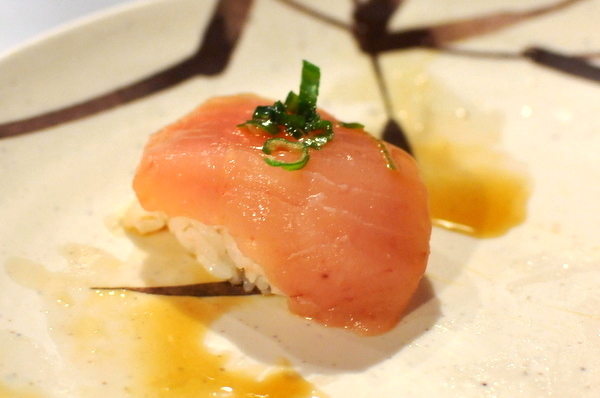 The baby tuna with ponzu and scallions is the traditional opener to the omakase at Nozawa. Frankly I don't see what all the hype is about. 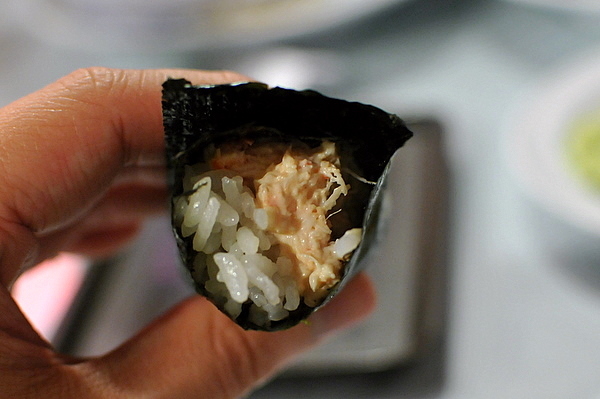 The classic combination is tasty but the fish itself isn't particularly noteworthy, perhaps a touch oilier than the subsequent tuna nigiri. 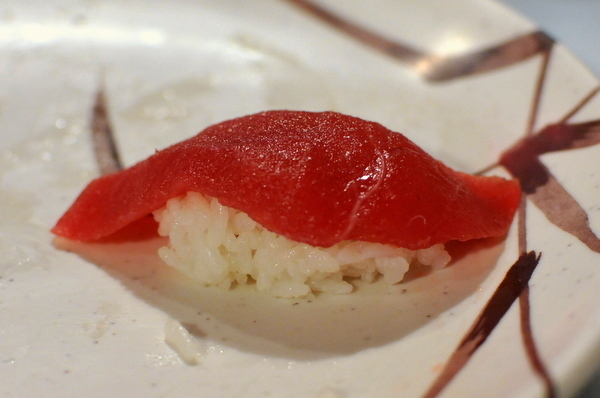 Like the preceding sashimi, the tuna here was clean and soft with no gristle or tendon. A very well executed classic. 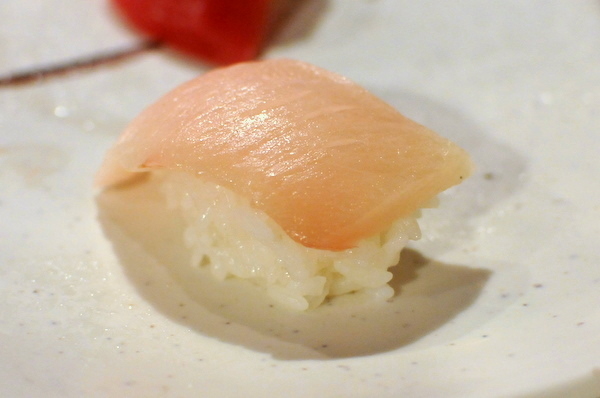 Another staple fish, the yellowtail was immensely tender with a jellied consistency and fairly robust oiliness. Not sure what kind of oyster this was but the bivalve had a creamy mouth feel and and ankimo-esque richness. 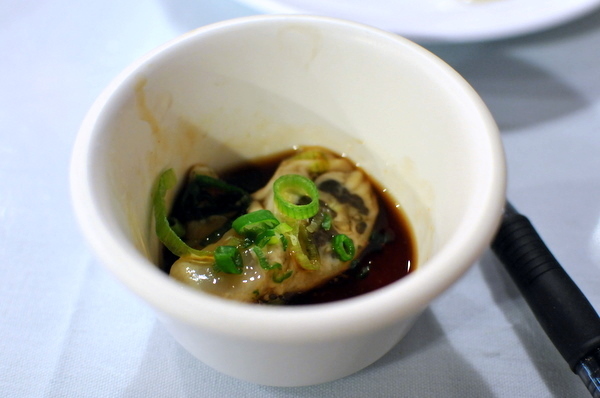 Great use of the ponzu to cut right through the richness of the oyster. Again an immaculately cut immensely tender piece of fish. The salmon had a pronounced sweetness that paired nicely with the light toastiness of the sesame. 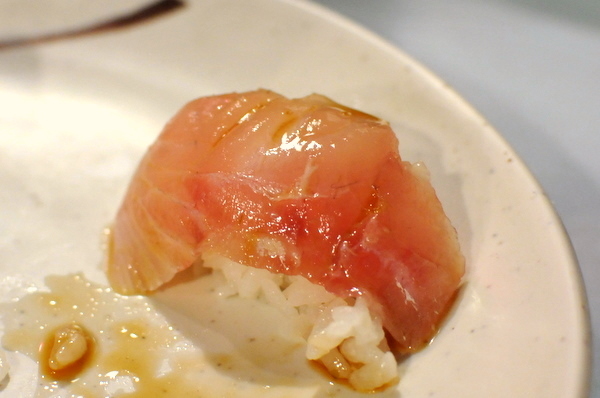 The albacore was so soft that it felt less like meat and more like a dense jelly. 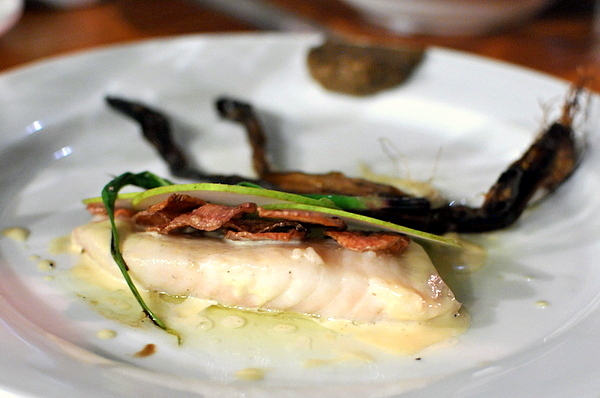 The fish came topped with classic accompaniments of ponzu and scallion. This might be my first experience with cooked sweet shrimp. Thankfully the shrimp retained its characteristic snap though the flavor was markedly more savory than the raw preparation. I've been appreciating good snapper more lately. Though this particular example lacked the typical firm flesh, I enjoyed the way the pickled kelp added a touch of sweetness on the palate. 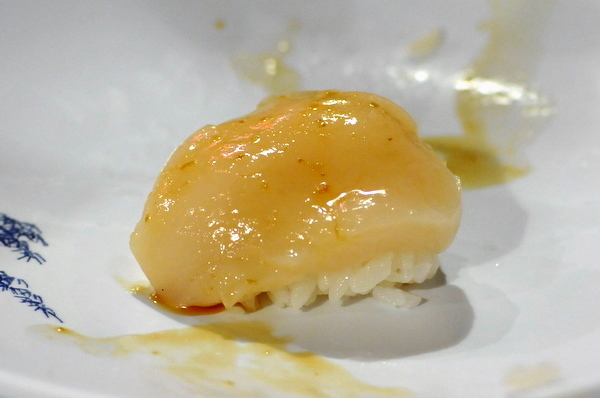 For someone who abhors spicy tuna, I was surprised to see Nozawa do scallops covered in mayo. The intrinsic sweetness of the scallops is heightened by the mayo while the embedded bits of tobiko adds fishy counterweight. This was one of the standouts from my first trip. 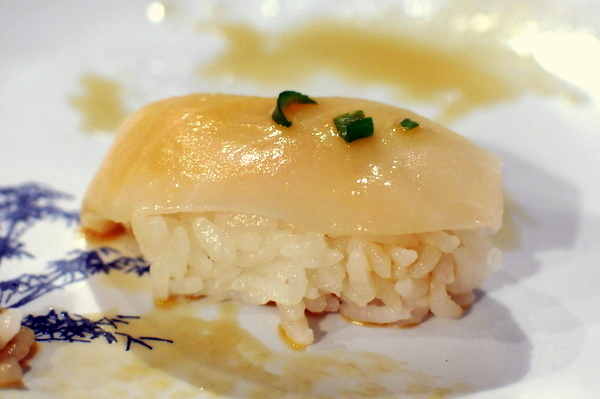 The halibut comes with a coating of yuzu kocho, its citrus bite perfect for enlivening an otherwise mild fish. 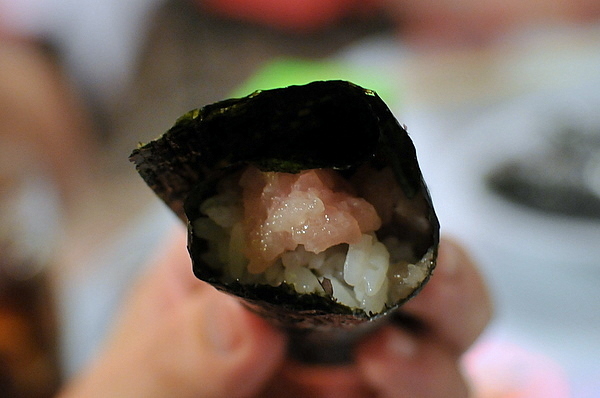 Next we transitioned to hand rolls. 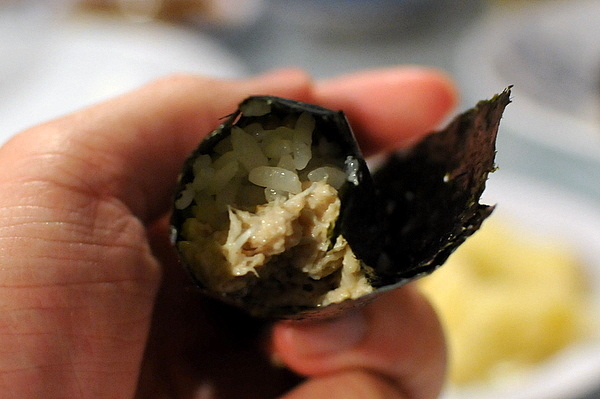 First up a tuna hand roll supposedly made with toro bits. 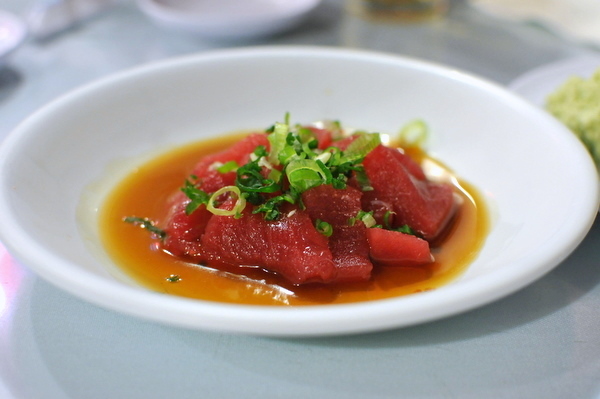 The macerated tuna was remarkably tender but I didn't notice any added richness from the fatty tuna. 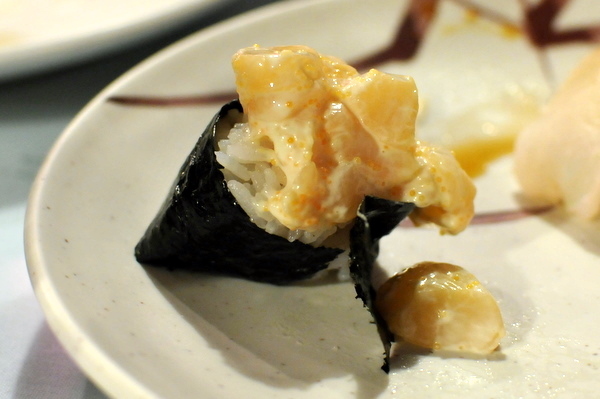 This was one of the better rolls the light coating of creamy mayo augmenting both the crabs sweetness and salinity. I also quite enjoyed the contrast between the warm rice and cool shredded crab meat. This was probably my favorite of the rolls. The yellowtail was one of the oilier fishes available and the flavor worked extremely well with the fresh contrast of the scallions. 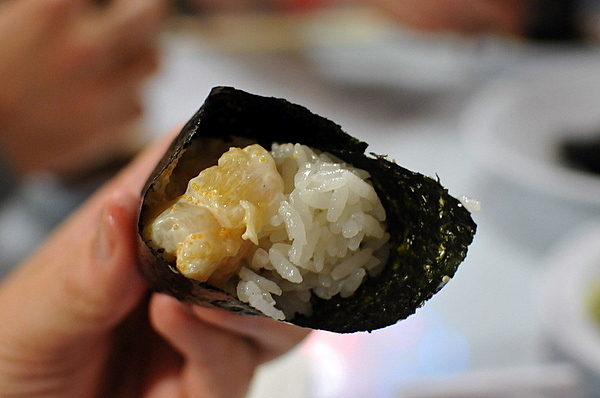 This was basically a redux of the creamy scallop sushi in a bigger hand roll form. Same creamy sweet goodness tinged with salty flying fish roe. 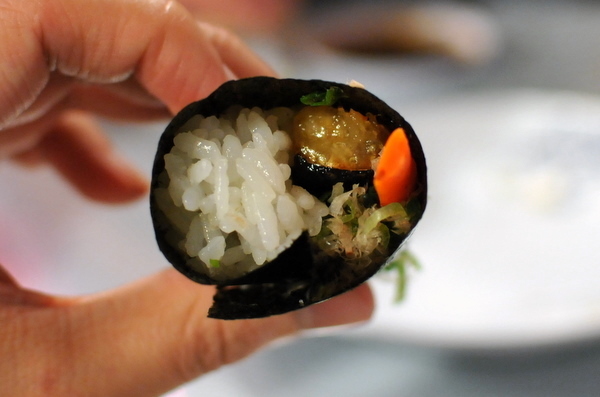 This was my first time having ankimo in a roll and the flavors just never worked for me. The liver is slathered with some kind of sweet sauce but the flavor profile progressed from sweet to eggy to bitter, reminded me a bit of Ludo's ankimo actually. Personally I suspect the restaurant doesn't sell too much of this so the freshness might not have been up to par. 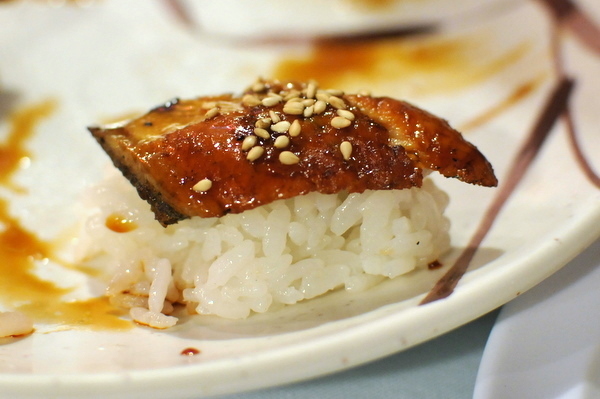 Prototypical anago, the lighter more restrained cousin to unagi. 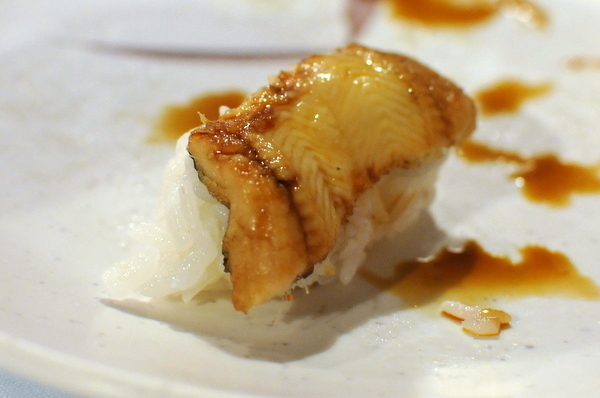 The sea eel has a noticeably leaner almost mealy texture and more apparent fishiness. Compared to the sea eel, the freshwater variety is softer, fattier, and sweeter definitely easy to see why this is the more popular of the duo. Perhaps the most interesting item of the night. Biting down on the fried skin releases a rush of heady fish oils augmented by the smoky essence of the bonito. Pickled carrot and fresh scallion provide some balance to the skin's heft. 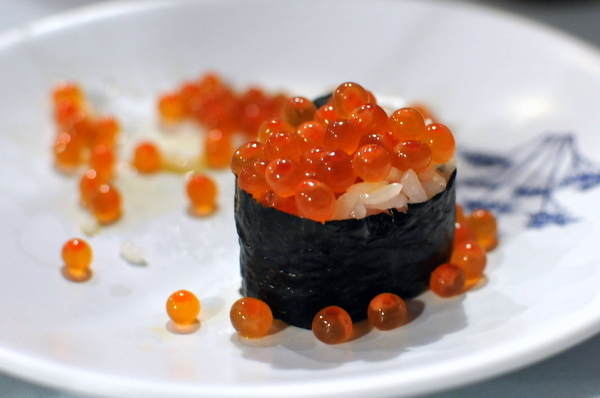 One of the better examples of ikura that I've had in awhile. Popping the globules releases a cool salty brine juxtaposed nicely with the warm rice. Another of the night's stronger dishes. The scallops come pre-seasoned with yuzo kocho and I loved the byplay between the scallops natural sweetness and the bracing heat of the condiment. An off menu item, the couple at the bar recommended we try this and I'm glad that we did. Denser and richer than the earlier fishes, the cod had a pronounced tang to it. They actually forgot to bring this earlier or we might have finished eating in under an hour. Flavor-wise this felt very similar to the crab roll but slightly sweeter, not bad but I prefer the saltier flavor of the crab roll. 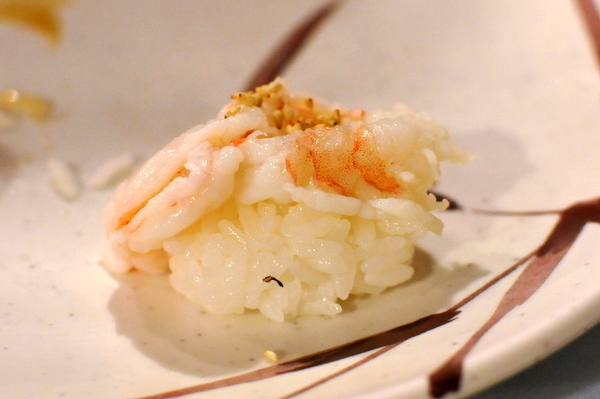 Our meal at Nozawa was just what we expected, traditional no-frills sushi. I didn't notice any gristle or tendon which speaks well of the quality, but most of the fishes had similar textures and flavor profiles. 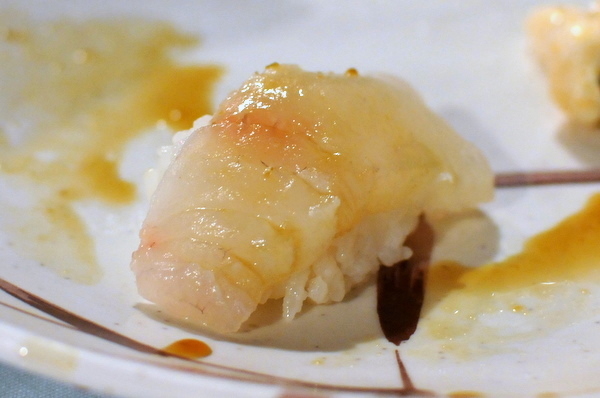 The fish selection is relatively narrow by modern standards so don't expect to see Sayuri or Shima Aji on the menu. What did throw me off was the rapid fire service; our entire 22 course meal took 64 minutes or just under 3 minutes a course. I put timestamps next to each course to provide some idea of the pacing. At times it felt like we were just chewing and swallowing without really savoring the flavors, hence the brief descriptions with each course. Considering how much effort the chef puts into the food, you'd think he would want the diners to spend more time enjoying it. While the food was quite good, the speed coupled with the ever present fear of offending Nozawa makes for one of the most stressful dining experiences in recent memory. With more traditional sushi restaurants available today, there are plenty of places that have comparable food sans the oppressive atmosphere. Still, love him or hate him, nobody can deny Nozawa-san's impact on the LA sushi scene and its hard not to feel a bit melancholic at his iconic restaurant's impending closure.